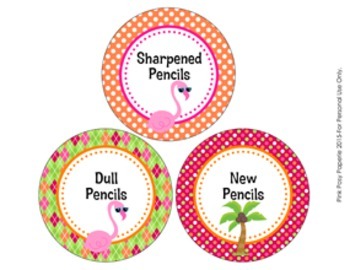 These sweet flamingo theme pencil labels are great for adding to your pencil cans, buckets or caddies. The labels measure 4 inches. Print onto cardstock and laminate for sturdiness. Trim and adhere to container. File contains 3 labels on an 8 1/2 x 11 sheet. Graphics by JW Illustrations and Happy Heart Studio.